Are you looking for some good calico cat names? Here you will find a few names inspired by calico cats. And since most calicos happen to be female, most of the names listed here are names for girl cats. However, some of the names are great for the boys, too. 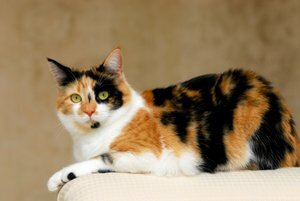 Calicos are known for their unique coat. These felines sport a colorful coat in three distinct colors: red (or orange), black and white. They remind me of a beautiful tapestry. Their unique color and markings were the inspiration behind most the following name selections. Other names were inspired by the word calico. Do keep in mind that you don’t have to give your cat a name based on her physical appearance. You can select a name that reflects your cat’s personality or any other name you like. Remember that the most important factors to consider when choosing your cat’s name are your personal preferences and your cat’s acceptance of such name. I hope this list helps you find the right calico cat name for your kitty. For additional cat names, please visit the links below.